Woke up this morning around 9am and had our breakfast. We had some of those fresh peaches we bought yesterday on our cereal… Very tasty. We checked our emails and lazed around our motorhome for the rest of the morning. We went to the Flying Saucer Restaurant for lunch. As the name implies, the restaurant is in the shape of a flying saucer. This is also a Roadside Attraction so I get to put a tick mark on my app that we have visited here. Neither of us were too impressed with this place. The food was mediocre at best and to pay $30.00 for lunch seems rather on the expensive side for a roadside diner. This place gets good reviews on Trip Advisor, but those reviews seem to be mostly about the breakfast meal. I think we would have been better off to have come earlier and try the breakfast menu rather than the lunch menu. The milkshakes were not even all that great. We didn’t get to meet any aliens either. We went back to the motorhome and I dumped the grey and black water tanks. We have full hookups here at the KOA so I just had to pull the valves and let the stuff flow through our sewer hose and into the campground sewer system. I will dump the tanks once more before we leave in a few days. Around 3pm we took our rental car back to the rental office and handed it in. We won’t need the car for the duration of our stay here in Niagara Falls. We will ride the WeGo Transit System. The bus stops right here at the KOA and it will take us directly to the Falls. It is just a one bus ride, no transferring involved. Our plan tomorrow is to go and spend the day at the Falls. For dinner I fired up our Weber Q bbq and cooked us up some steaks. Also did up some potatoes and onions with butter and spices wrapped up in foil. I also got our campfire going so that we could make some S’mores for dessert. First you roast a marshmallow. 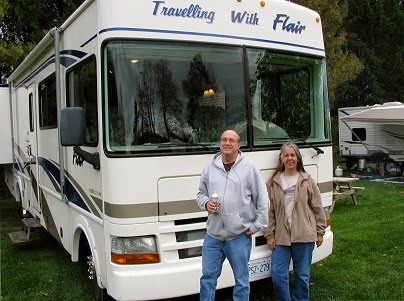 Karen is smiling and she would like s’more…..
After that blast of sugar and calories we take a walk around the KOA campground till it started to sprinkle rain and we headed directly back to our motorhome for the evening.